Tailoring your resume has never been faster. 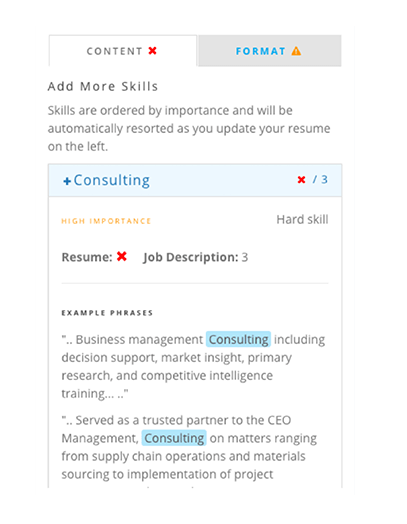 Power Edit leverages AI and machine learning to take resume tailoring and optimization to the next level. Save time with Power Edit. Power Edit is part of Jobscan Premium, which also includes unlimited resume scans, LinkedIn Optimization, and other exclusive tools. Sign up for the 30-day free trial to Power Edit your resume today. 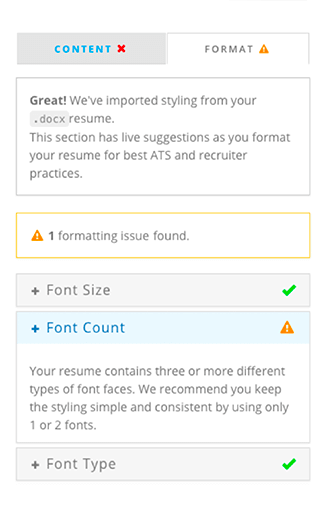 Fix formatting issues right in the resume editor to create a professional resume that is both ATS compliant and recruiter-friendly. Export your new resume when you’re done. Optimized resume keywords means more job interviews. 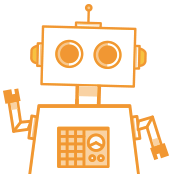 Boost your rank in the applicant tracking systems used by most hiring companies. Jobscan Power Edit makes it fast and easy to add missing keywords and export an optimized resume.